Two fruit trees have been stolen from a community orchard in Dunblane. Police are investigating after a Black Oliver cherry and a Sweet Prune damson were dug up and taken away by crooks last week. Those responsible would have had to cart the trees, complete with stake and protective netting, out of the park without being detected. A Clydeside apple tree was also pulled up and thrown over a nearby fence but has since been recovered and replanted. 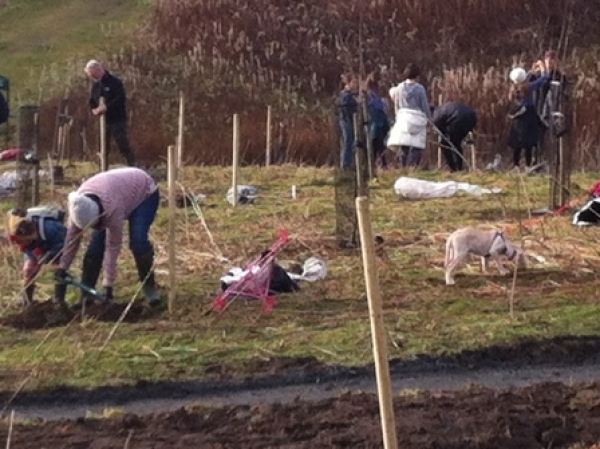 All three were introduced to the Laigh Hills by volunteers over a weekend in December as a community orchard, comprising 300 fruit trees in total, was created. The £5000 project, which was led by the Friends of the Laigh Hills, was made possible thanks to the hard work of the community and funding from the Tesco Bags of Help grant scheme. Police visited the orchard after last week’s theft and they want anyone with information to come forward. Alan Booth, of Dunblane Community Council, said: “That somebody would do this is disappointing for all those who gave up their time to help plant the trees. “We would urge users of the Laigh Hills to join Friends of the Laigh Hills group and notify us if they see anything unusual – be that things going wrong that need attention or new sightings of plants or animals that they want to share. “The good news is that the vast majority of the 300 trees we planted in December are now thriving.” The community orchard is thought to be one of the biggest of its kind in the area with a vast collection of trees planted to produce fruit in years to come. The trees came from a specialist fruit tree nursery near Perth and include Clydeside, Scot’s Bridget, Stirling Castle, Lemon Queen, Green Chisel, Gordon Castle and Black Oliver. Mr Booth added: “The orchard will be a great asset, encouraging wildlife as well as producing fruit for all to enjoy. “It forms part of our plans to make the Laigh Hills a better place for people and wildlife.